Lisa Wright's abstract wonders at the Art Zone Gallery. If you haven't been to the Art Zone Gallery, the newest kid on the Halifax block, now's the perfect time. 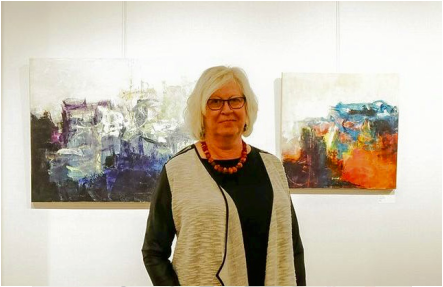 They've just unveiled painter Lisa Wright as their featured artist for August and her collection, Two Worlds Touch, is a colourful, dramatic treat for any abstract admirers out there. cluelessartcritic@lisawrightabstract's new show at the Art Zone Gallery is right up my alley! Inspired by my favourite abstract expressionists - Rothko, De Kooning, Pollock, Kline - she lets the painting create itself, layer by layer. Lisa is the gallery's features artist for August so you have plenty of time to catch her work! ​Saatchi Art's Chief Curator and Director, Rebecca Wilson, has included my painting "Impulse to soar" in the online gallery's curated selection of the week. July 27, 2015.